This year we are celebrating 100 years of Cubbing worldwide! Many Cubs, parents, Cub Packs, Scout Groups, Districts and Regions have had fun whilst remembering the impact Cubbing has had on their lives . 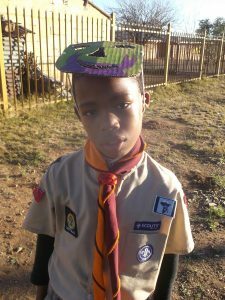 We spoke to Oarabetse Legegeru (9) from 5th St. Peter’s Cub Pack in the Free State about the joy that is Cubbing. Cubbing is so much fun because we go hiking and we go on awesome camps. My best experiences were the hikes and also camping! There isn’t really anything weird. Everything we have cooked with our Akela was nice! The toughest challenge for me is hiking. The most amazing place was the Erlichpark Fire Station. By being a Cub I learnt about first aid, drawing, singing and also how to paint. As I am a Messenger of Peace, I gave food and blankets to people in need. I taught my mum songs that I had learnt at Cubs. A good Akela must be a good leader and must also love kids. She always has something new to teach us. Cubbing Rocks because … I make new friends and we visit other Packs.